We support people who live alongside the World Famous Darjeeling Himalayan Railway, from Siliguri on the plains to Darjeeling, which is 55 miles away and 6.800 feet up in the foot hills of the Himalayas. The people are a mixture of Indian, Bangladeshi, Nepalese and Tibetan. A large proportion of the community have no running water, very poor sanitation, and in the smaller villages medical facilities are non-existent. The state education is very basic and the schools are poorly equipped. Unemployment is high due to the decline of the railway and the closure of the tea estates. However, the good news is that £1 goes a long way and can make a difference. A member of the 2006 DHRS Tour party suggested that ‘we should do something to help the local people’. Upon our return to England a meeting was held and thus Darjeeling Railway Community Support was formed early in 2007. Mr. Vivek Baid, Chairman of the DHRS India Support Group, offered support and advice to DRCS on appropriate projects in their area. While this partnership continues, we have also enlisted the help of NGO’s in Darjeeling and Kurseong, who have first-hand knowledge of the needs of local people who live in the foothills. Because members of the Darjeeling Himalayan Railway Society visit the area regularly we can monitor how the money is spent. Initially we helped to fund health camps in Siliguri and Rangtong , purchased 2 sewing machines and helped to set up a tailoring project for the women of Gayabari village. We have also supported local schools with equipment and funds for improvements to their buildings, such as paint, concrete for a new floor, a kitchen and a toilet. DRCS have also supported Hayden Hall. 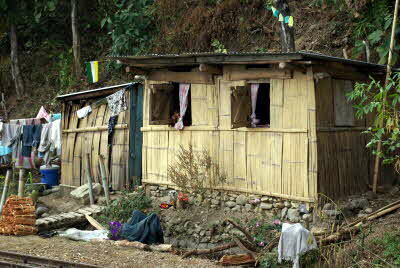 This is a charitable organization which undertakes a lot of good work in Darjeeling. One of their many projects includes an after-school club which provides a meal and a space where the children can do their homework. The Shankar Foundation, ‘who protect and promote the rights of people and families living with hiv/aids’ have also received money from DRCS. The Planter’s Hospital, which is an iconic building in the centre of Darjeeling, has fallen into serious disrepair over recent years, yet they still continue to provide low cost treatment for those in need. DRCS have sent a donation to the Director, Dr Plaban Das, to help with repairs to their leaking roof. We have held tea parties, curry suppers, tombola stalls, baked cakes, and given illustrated talks to various groups. However, our main source of income is from donations and standing orders. We are always looking for people who are willing to help in any way with fund-raising efforts, spreading the message or running the Charity. You can become a Trustee, set up an area group, give a talk or run a fund raising event. We can provide information and other resources to help. • giving regular donations by completing a Standing Order Mandate.